I got this good-condition softcover at a local Savers thrift shop. 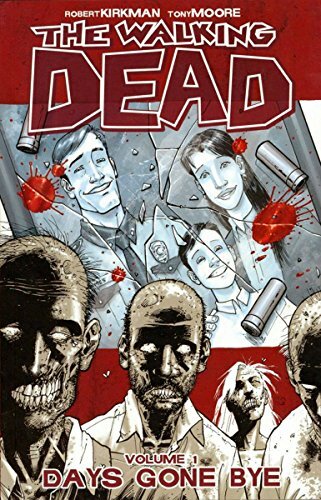 It contains the first six issues of the original "Walking Dead" comic books - the ones that inspired the hit TV series. The stark artwork here enhances the very (very, very!) grim story, showing how sheriff Rick wakes up alone in a hospital - and has to gradually discover that while he was in a coma, the world has changed forever. His search for his family, the attacks and challenges along the way, and the gripping and shocking scene at the end of this volume (one of many situations where the TV series departed from the source material) - all quite stunning! I left this book in the new Little Free Library; hope the finder enjoys it!